Darjeeling, October 6, 2017: Two persons have been arrested from Darjeeling in connection with the attack on West Bengal BJP President Dilip Ghosh and other BJP leaders in Darjeeling on Thursday. One Chandan Thapa (29 years) of Rishihaat Tea Estate along with Santay Gurung (42) also of Rishihaat tea Estate were arrested in the wee hours of Friday in connection with this case registered at the Darjeeling Sadar police station. "The arrested are GJM supporters. They have been charged under Sections 341/323/325/354/379/506/35 of the Indian Penal Code. They will be produced at the Darjeeling Chief Judicial Magistrate Court" stated a police official. Incidentally Ghosh along with other BJP met with protests in Darjeeling while attending a programme at GDNS Hall in Darjeeling on Thursday. Ghosh called off the programme and while walking towards the Chowk Bazar, the BJP leaders were heckled on the Hill Cart Road. While Ghosh along with BJP West Bengal Vice President Jayprakash Majumdar were pushed and shoved; Sagar Pokhrel, Darjeeling District Yout President , BJP and Deb Saha, Personal Secretary to Ghosh were grievously injured. Ghosh alleged that the whole incident was orchestrated by the TMC led West Bengal Government and executed by inebriated supporters of Binay Tamang. Meanwhile the protestors have also lodged a counter FIR against the BJP leaders alleging that the BJP leaders were inciting unrest by giving provocative statements. They Fir further alleged that even women protestors were manhandled. The police has initiated a case based on this FIR. BJP protests rallies were brought out throughout the state and some important thoroughfares in the State were blocked in protest. The BJP will be taking out a protest rallies in Kolkata at 1:30pm on Friday. BJP leaders will also be meeting West Bengal Governor Keshari Nath Tripathi on Saturday over this incident. BJP President Amit Shah has called for a report on this incident. A war of words has ensued between GJM President Bimal Gurung and rebel leader Binay Tamang over this incident. Gurung has vehemently condemned the incident and has dubbed it as a "conspiracy by the West Bengal Government, Binay Tamang and Anit Thapa." "It is a conspiracy to derail Gorkhaland. Dilip Ghosh had come to Darjeeling to survey the ground reality before our meeting with the Union Government. In order to foil this Tamang sent drunk men and roughed up the BJP leader" alleged Gurung. He further warned that all involved will have to face the consequences. "We will not tolerate this. We have seen the footages. The ones involved will not be spared. We will give a befitting reply. No one can stop this. The situation that will emerge cannot be stopped now" warned Gurung. Meanwhile rebel GJM leader has blamed the Bimal faction of the GJM for attacking the BJP leaders. "We have footages. Bimal Gurung's supporters attacked the BJP leaders and are blaming us just to malign us" alleged Tamang, washing his hands from the incident. "The BJP leaders hurt public sentiment. This is the fallout of that. Dilip Ghosh in Kalimpong had stated that Gorkhaland cannot be created for 15 lakh people. This has hurt the public sentiment and they protested. However I vehemently condemn the incident and demand that all involved should be brought to book" stated Tamang. Meanwhile the police sources stated that the road leading to Patleybash area, the one time Gurung stronghold has been dug up in two places to prevent vehicles from running on the road. "It has been dug up by heavy earth excavating machines at Tukvar and Malidhura. It has been done by Gurung's supporters inorder to prevent police raids in the area" stated a police source. Gurung who has been charged under multiple case and even under the Unlawful Activities Prevention Act is on the run. There is a Lookout notice and arrest warrants issued in his name. 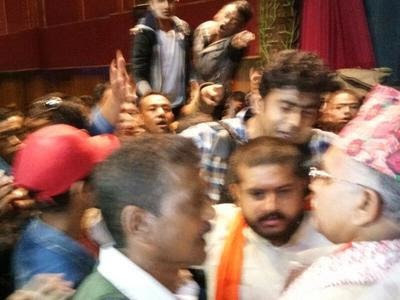 Two persons have been arrested from Darjeeling in connection with the attack on West Bengal BJP President Dilip Ghosh and other BJP leaders in Darjeeling on Thursday.